Obesity stigma is common in our society, and a general stigma towards obesity has also been documented in physicians. 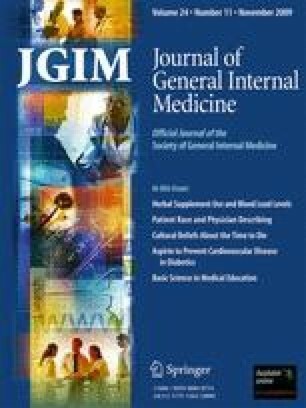 We hypothesized that physician respect for patients would be lower in patients with higher body mass index (BMI). We analyzed data from the baseline visit of 40 physicians and 238 patients enrolled in a randomized controlled trial of patient-physician communication. The independent variable was BMI, and the outcome was physician respect for the patient. We performed Poisson regression analyses with robust variance estimates, accounting for clustering of patients within physicians, to examine the association between BMI and physician ratings of respect for particular patients. The mean (SD) BMI of the patients was 32.9(8.1) kg/m2. Physicians had low respect for 39% of the participants. Higher BMI was significantly and negatively associated with respect [prevalence ratio (PrR) 0.83, 95% CI: 0.73–0.95; p = 0.006; per 10 kg/m2 increase in BMI]. BMI remained significantly associated with respect after adjustment for patient age and gender (PrR 0.86, 95%CI: 0.74–1.00; p = 0.049). We found that higher patient BMI was associated with lower physician respect. Further research is needed to understand if lower physician respect for patients with higher BMI adversely affects the quality of care. This work was supported, in part, by grants from the National Heart, Lung and Blood Institute (R01HL069403 and K24HL083113). MMH was supported by the Johns Hopkins Clinical Research Scholars Program (NCR 5K12RR023266). The authors would like to acknowledge Kathryn Carson for her assistance with data management.